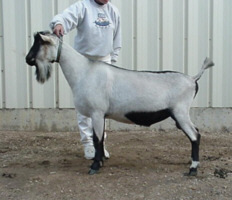 Our goal is to raise healthy goats that will produce a reasonable quantity of quality milk. We have heavy producers that are also high quality show goats. We have does that are finished grand champions that have produced 4000 lbs. We are reaching for a reputation of some of the best dairy goats in the United States. We look at all the areas of the Dairy goat when developing our breeding program. General Appearance is always very important. We are most interested in improving the mammary system, so that it will support a heavy producer for many years. Our herd is extremely dairy with wonderful deep bodies.